Sun City and Rotary e-Club 5870 members held another successful fundraising event at the HEB Center on Aug. 17 to help raise money for Rotary activities. This particular event was a rodeo, and members Bill Piotrowski, Karen Block, John Skannel, Adaire Wolf, and Cole Harris participated. Training is required to volunteer, but this is a great way to help raise money and enjoy the company of fellow Rotarians. If interested in learning more, contact Bill Piotrowski. CAP in LA Parroquia, La Zona Reyna – Rotary project, celebrated the completion of purchasing and outfitting the clinic with their new medical equipment, project includes training of midwives and nurses for maternal and child health. 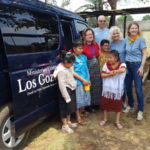 Los Gozosos, Chimaltenango – UbF project, celebrated the donation of a transport van to an orphanage for special needs kids. A majority of the kids are lifelong residents of the facility, as they have no families that claim them. Caracol, Caracolito, Joya Large – Rotary project, celebrated the completion of a water supply project and the eventual completion of latrines. Uspantan Hospital – Past Rotary and UbF projects, checked on past projects that have included supplying an ambulance, industrial washer and dryer for cleaning hospital linens, and ultrasound and other equipment. Semutz and Tamborcito, La Zona Reyna – Rotary project, celebrated the start of a new water project in these two remote villages. The residents were much more accepting of us as visitors than they were the first time we visited last year. We have developed some trust in the community. In addition to the above projects, we visited a number of proposed project sites where communities requested either a school or water project. After leaving Uspantan, the team then reviewed the list of potential projects to assess which projects are viable for Rotary and/or UbF. Wow! A new Rotary year is underway. It started off on a good note with a very successful RYLA camp. One hundred teenagers came from all corners of our district. New friendships were made. Campers learned about service and inclusiveness. There was some work and lots of fun. Rotary is the only organization that changes leadership annually at all levels; from the Rotary International President to the Club President. For me, the journey to serve as your governor started two years ago. There has been a lot of preparation. I’ve met many of you during club visits along with Rotarians around the world. 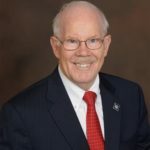 My commitment to the district governor interview committee was to leave the district better off than when I start my year of service. I hope you share my excitement and will join with me to make a difference in the year ahead and have fun on the journey. Each of our clubs has a different personality, but all share a common goal to make a difference locally and globally. I look forward to learning more about your projects and how your club reaches out in your communities and the world. 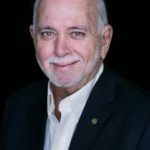 Rotary International President Barry Rassin selected “Being the Inspiration” as his theme for this year. Let us inspire ourselves to new heights and transcend the barriers we encounter. The possibilities are only limited by our vison and efforts. Myself, along with all the district volunteers are a resource to assist you. August will find training options that will take a deeper dive into the workings of the Rotary Foundation, club membership growth and retention ideas, along with public image training. 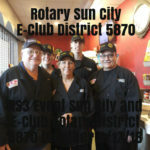 Please see the district calendar on our website, https://rotarydistrict5870.org for training dates and to register. Have a great year; be proud to be a Rotarian. A well-known saying goes, “If you want to change the world, go home and love your family.” That doesn’t mean people should ignore the needs outside their own homes; instead, they should pay attention to the needs within. It can be tempting, when our priority is service, to focus only on the things that look like service: the projects, the planning, the work that yields a visible benefit to those who need it. But to do that work effectively, we need to keep our own house in order. In Rotary, that means conducting ourselves in accordance with the principles of Rotary, treating others with respect, and following The Four-Way Test. It means maximizing our impact by planning carefully and stewarding our resources wisely. And it means looking after the long-term health of our organization by ensuring that our membership is strong, engaged, and healthy. Our membership has hovered around the same 1.2 million mark for 20 years. We aren’t growing, and our membership is getting older. We have too many clubs that don’t have the knowledge or motivation to have an impact: clubs that don’t know what we’re doing on a global level, clubs that don’t know about our programs or our Foundation, that don’t even know how to get involved. And with a membership that is still mostly male, we clearly aren’t doing enough to become the organization of choice for women who are seeking to serve. We are a membership organization first. If we want to achieve the goals we’ve set for ourselves, we need to put membership first. All of us have a responsibility to take membership seriously, not only by inviting prospective members, but also by making sure new members are welcomed into clubs that offer them something of value. If you see someone walk into a meeting and hesitate, be sure that person has a place to sit and is part of the conversation. If you’re enthusiastic about a Rotary program, make sure your club knows about it and knows how to get involved. If you see a need in your community, talk about it at this week’s meeting. If we want to be part of an organization that’s strong, that’s active, that’s having an impact – start at home, and Be the Inspiration in Rotary.